Hello Friend, There is a good news for you. Rajasthan Rajya Vidyut Utpadan Nigam Limited has issued notification for appointing candidates on 1360 Helper-II Vacancies. Participants should check here education qualification, age, & Selection Criteria for RVUNL Recruitment 2018. Applicants must fill up their application form before last date 21.09.2018. Online Registration for RVUNL Vacancy 2018 begins from 07.09.2018. For further more information regarding application fee, Pay scale, etc read below article carefully. Here we provided you links to download RVUNL Notification 2018. Important Dates of RVUNL Technical Helper Jobs 2018 – What is the Last Date of Apply For JVVNL Recruitment? Fresh Updates as on 19.09.2018: Hello Friends, Are you looking for Helper-II Jobs? If Yes, Candidates must apply online for RVUNL Recruitment 2018 from links given here. There are 1360 Posts are vacanct for interested applicants. 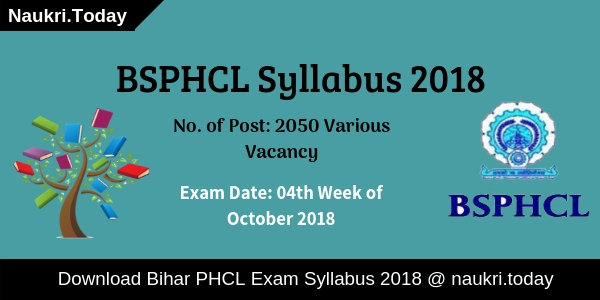 Fresh Updates as on 14.09.2018: Participants must apply online for RVUNL Helper-II Vacancies. Applicants should check here eligibility criteria for RVUNL Recruitment 2018. Here we gave you links to apply for RVUNL Helper Vacancy 21018. Aspirants should fill up all the details carefully in the application form carefully, Otherwise, their form will be rejected. Participants must check here education qualification, age, & Application fee for RVUNL Vacancy 2018. Applicants who found themselves eligible for Raj Helper Recruitment must fill up their application form carefully before 21.09.2018. Participants who are participating in Raj Helper Vacancy must have 10th pass Certificate from CBSE/RBSE. Further more details about Helper Jobs 2018 applicants should read official RVUNL Notification 2018. Candidates who full fill the eligibility criteria may apply online form links given here. Participants must be 18 years and not more than 28 years are eligible for RVUNL Recruitment 2018. Candidates who belong to Schedule Caste and Schedule Tribe are relaxed by 5 years. An ex-serviceman should not complete 50 years of their age are eligible for Raj Helper Bharti 2018. Participants should read RVUNL Notification for more information. the Department will set a particular amount of application fee for all category. So, Participant of General Category, If their income is more than 2.50 lakhs need to pay Rs. 850 / for RVUNL Recruitment 2018. Candidates of UR Category, SC, ST, OBC category, If their income is less than 2.50 lakhs should pay Rs. 550/- for an application fee. For more information aspirants should check RVUNL Notification 2018 from links given here. Selection of Candidates should take place on the basis of written examination and Interview For Raj VUNL Recruitment 2018. Final Merit list should be created according to marks obtained by aspirants in a written examination. Applicants who will pass in written examination will call for Interview. 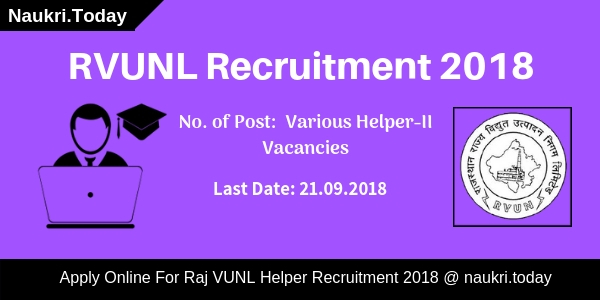 Participants should read official RVUNL Helper Recruitment 2018 notification for more details. Rajasthan Rajya Vidyut Utpadan Nigam Limited has paid a good amount of salary to the selected candidates. The Department will pay Rs. 12600/- to the selected applicants. Aspirants must prepare hard to gran RVUNL Helper Jobs 2018. Here we gave you links to download RVUNL Notification 2018. Participants should check eligibility criteria, age and pay scale before applying for RVUNL Jobs 2018. Interested applicants may register online form links given here before 21.09.2018. The Department may exempt candidates from payment of application fee for Raj VUNL Recruitment 2018. these Easy and Simple Steps will help you to download RVUNL Recruitment notification 2018. Firstly, Applicants should log on to official Website Raj VUNL i.e energy.rajasthan.gov.in. Candidates must click on menu button for RVUNL Recruitment option. Now Click on RVUNL Helper Jobs Notification PDF. After that Candidates should read the complete notification carefully. Eligible candidates should apply for Raj VUNL Helper Bharti. Participants must insert their passport size photo and signature in an application form. After completing all the details in an application form, aspirants may click on submit button. Applicants must take print out of RVUNL Application form for feature use. Conclusion: Rajasthan Rajya Vidyut Utpadan Nigam Limited has announced 1360 Helper-II Vacancies. Interest candidates must fill up their application form for RVUNL Recruitment 2018 before last date. Check Here Qualification, age, and selection process for Raj VUNL Helper Bharti 2018. Jaipur Vidyut Vitran Nigam Limited has issued notification for recruitment of 2433 Technical Helper Posts. Candidates who are interested and eligible to apply for RVUNL Recruitment 2018 may fill online form either here or official site. The online registration form is available from 02nd July 2018. Participants can fill JVVNL Technical Helper Vacancy online form till the last 23.07.2018 now extended 31st July 2018. More information of RVUNL Jobs like eligibility criteria, application fees, selection procedure, how to apply is mention below. Rajasthan Rajya Vidyut Utpadan Nigam Limited has recently published an advertisement for 2433 तकनीकी सहायक posts. RVUNL Technical Assistant Recruitment 2018 is released for a vacancy in JVVNL, AVVNL, JDVVNL department. The official JVVNL Notification will release on 02nd July 2018. Candidates can fill RVUNL Jobs 2018 online form either here or official site. Furthermore, information about how to fill RVUNL Technical Helper Vacancy Online Form? What is the Last date to Apply online for JVVNL Recruitment? check from below section. Fresh News as on 27th July 2018 : To fill online application form of RVUNL Technical Helper Jobs the last date extended till 31st July 2018. Applicants can fill JVVNL Jobs for Technical Helper can apply through online link. Applicants who are interested to apply for RVUNL Vacancy must check their eligibility conditions. It includes education qualification, age limit and other information. RVUNL Technical Helper Jobs eligibility details is mention on below section. Applicants must completed their Madhyamik School Pariksha from recognized Board. Applicants also have eligibility of lineman/Electrician/power electrician/wireman/MBA in Business/NSC and other. Furthermore details check RVUNL Technical Assistant Vacancy Notification. Candidates must be completed 18 years if they are applied for RVUNL Recruitment 2018. Applicants should not be more than 28 years for RVUNL Technical Helper Jobs 2018. Upper age relaxation is applicable as per govt. norms. Applicants selection will be made according to their education qualification and written examination. Applicants must check full notification of RVUNL Jobs if they have doubt of selection procedure. Now the department has not released application fees. When RVUNL Technical Helper Bharti notification is released application fees details mention on it. You can check here also on 02nd July 2018. Applicants who are interested and eligible for JVVNL Jobs 2018 can fill an online form. Candidates must have valid email id and mobile no. before going to apply online. Participants also have a scan copy of signature and photograph. To fill RVUNL Technical Helper Recruitment, you can follow some given below instructions. First of all, log on to the official site energy.rajasthan.gov.in. Download Rajasthan RVUNL Technical Helper Jobs Notification. Then read it very carefully. Now go to apply online for RVUNL Recruitment 2018. Enter all required information like personal and educational. Applicants then make payment of application fees for JVVNL Recruitment. Submit Your RVUNL Technical Helper Vacancy Online Form. Conclusion : Rajasthan Rajya Vidyut Utpadan Nigam Ltd. has recently published employment notification for 2433 posts. RVUNL Recruitment advertisement is released for 2433 Technical Helper vacancy in JVVNL, AVVNL, JDVNL department. RVVNL Technical Helper Vacancy Online Form last date is 31st July 2018. Rajasthan Rajya Vidyut Utpadan Nigam Limited has recently published employment notification for 69 Personnel Officer and Accounts Officer. The online registration for RVUNL Recruitment is already started on here as well as official site. Applicants can fill RVUNL Accounts Officer Vacancy Online Form from 22.05.2018. The last date of registration is 11th June 2018. So all interested and eligible candidates can read here RVUNL Jobs full information. Furthermore, information like eligibility criteria, application fees, selection procedure and how to apply are mention below. Latest Update as on 11.06.2018: If you want to apply for RVUNL Recruitment 2018, then fill up application form immediately. because today is last date to apply online for RVUNL Jobs 2018. Applicants can fill online application for Junior Accountant, Junior Assistant and other vacancies. So click on mention below direct link to fill up Rajasthan RVUNL Online Form 2018. Candidates who want to apply for RVUNL Recruitment 2018 must fulfill given eligibility conditions. if you are found not eligible at the time of filling the application form, your form will not be accepted. So must-read education qualification, age limit details to ensure your eligibility. For Accounts Officer : Applicants should completed CA/ICWA. Or have MBA/ M.com Degree minimum from a recognized university. For Personnel Officer : Candidates must hold Graduation Degree with at least 55% marks. Applicants also completed Post Graduation with Social works or MBA/ Labour Laws & HR. Furthermore information check RVUNL Recruitment Notification, which is mention on below section. Candidate must completed 21 years as on 01.01.2019. For RVUNL Personnel Officer Jobs not more than 43 years. Upper age relaxation is applicable as per govt. rules. 05 years : Male candidates SC/ST/BC/MBC and General Women Candidates. 10 years : SC/ST/BC/MBC Women Participants. 10,13,15 years : PH General, PH BC/MBC and PH SC/ST category. Applicants selection will be made according to written examination. The computer based written examination conducted on July/August 2018. There will be no interview for Rajasthan Accounts Officer Vacancy 2018. Furthermore, details of examination pattern check RVUNAL Exam Syllabus 2018. Fees will be paid for RVUNL Recruitment through online mode only using net banking/Credit card/Debit Card/Mobile Wallets etc. Interested and eligible candidates may apply online for RVUNL Vacancy. Applicants must have valid email id, mobile no. scan copy of photograph and signature. No other mode is accepted for RVUNL Personnel Officer Jobs. Get RVUNL Notification 2018 and read it carefully. If you are eligible then click on to apply online for AO or PO post. Enter you personal information and then you will receive unique id and password. Login with your id & password. Enter your educational information on your RVUNL Recruitment Online Form. Submit your RVUNAL Accounts Officer Vacancy Online form. Conclusion : Rajasthan Rajya Vidyut Utpadan Nigam Limited has recently invited online application for 69 Personnel Officer and Accounts Officer vacancy. Applicants may apply for RVUNL Recruitment 2018 either here or official site. The online registration already started. Now you can fill your RVUNL Jobs Online form till last date 11.06.2018. Are you searching employment notification of RVUNL Recruitment 2018 ? if yes, then here is latest news for you. Rajasthan Rajya Vidyut Utpadan Nigam Limited has recently published advertisement for 3151 Junior Assistant/Commercial Assistant, Junior Accountant, Stenographer & various vacancies. Applicants who are interested and fulfill eligibility criteria of RVUNL Vacancy may apply online either here or official site. RVUNL Junior Assistant Jobs 2018 online form is available from 22.05.2018. Applicants can fill the application form till last date 11.06.2018. Furthermore, information requires reading full article carefully. RVUNL is inviting online application for 3151 Junior Accountant, Personnel Officer, Legal Officer, Stenographer and Junior Assistant Posts. This is a great opportunity for candidates who want to apply for RVUNL Jobs. Candidates may apply only through online mode here as well as official site. RVUNL Junior Accountant Jobs 2018 eligibility criteria, application fees, selection procedure and other information is mention in below paragraphs. The online application link of RVUNL Junior Assistant Vacancy is also mentioned on below segment. So read full article properly. interested candidates who are going to apply for Rajasthan RVUNL Recruitment 2018 must ensure that they are eligible or not. Eligibility criteria include details of education qualification and age limit. So before going to apply for RVUNL Jr. Assistant Recruitment must check given below eligibility conditions. Assistant Personnel Officer : Candidates who are going to apply for RVUNL Assistant Personnel Officer Job must have Graduation Degree. Furthermore, details check official notification. Junior Legal Officer : Applicants who want to apply for RVUNL Junior Legal Officer Recruitment must complete Law Graduate from the recognized university. More details refer official RVUNL Recruitment Notification. Junior Accountant : If you are going to apply for RVUNL Junior Accountant Job must complete Graduation in Commerce or Business Administration. Applicants also have relevant diploma for like “O” level, COPA, Computer Science, RSCIT and other. Stenographer : Participants who want to apply for RVUNL Stenographer Recruitment must hold Graduation Degree. Candidates also complete computer courses like ‘O’ level, COPA, Computer Science, RSCIT and other. Junior Assistant : If you wish to apply for RVUNL Junior Assistant Job then you hold Graduation Degree. And same computer courses certificate mention on above segment. Furthermore, information regarding education qualification check RVUNL Vacancy Notification 2018, which is mention on below link. Candidates minimum age required for Rajasthan RVUNL Recruitment is 18 years. Participants who are not more than 43 years are also eligible to apply for given vacancies. The age criteria is made as on 01.01.2019. upper age relaxation is also applicable as per govt. norms. Applicants who are belonging to General Category need to pay Rs. 850/- towards RVUNL Vacancy. SC/ST/BC/MBC/PWD applicants are required to pay Rs. 550/-. RVUNL Junior Accountant Vacancy fees will be pay through online mode only. Furthermore, details check notification carefully. Applicants selection will be made according to their performance in written examination and skill test for RVUNL Recruitment. There will be no interview for any post. Furthermore, check RVUNL Syllabus 2018. If you are selected for RVUNL Recruitment 2018 you will also get an attractive salary. The salary will be made according to pay level 11, 10 & 5. Monthly salary for post wise is mention below. Candidates who are interested and also deserving for RVUNL Bharti may apply only online mode. Before going to fill online application form you must have valid email id and mobile number. For RVUNL Junior Accountant Jobs 2018 applicants also require self scanned copy of photograph and signature. Now you can follow apply the online procedure of RVUNL Vacancy 2018. First of all visit official site energy.rajasthan.gov.in. Go to Recruitment for Non-Technical Posts 2018-19. Download RVUNL Junior Accountant Recruitment Notification 2018. Read it carefully and then you ensure that you are eligible for it go to apply online link. Enter all required information on RVUNL Jr. Assistant Vacancy Online Form. Submit your RVUNL Recruitment 2018 Online form. Applicants also can apply online from given below link. Conclusion : Rajasthan Rajya Vidyut Utpadan Nigam Limited has recently announced employment for 3151 Junior Assistant, Jr. Accountant, Stenographer and other vacancies. Apply Online Here for RVUNL Recruitment 2018 either here or official site. Online registration is started from 22nd May 2018. The last date of apply for RVUNL Junior Assistant Vacancy is 11.06.2018. The full information is available on above section.